If you see any meat or fish for under one dollar per pound, buy it and worry about what to do with it later. I’m sure I am paraphrasing, but that was the message. When I walked into the supermarket last week I immediately came face-to-face with a refrigerated case full of half-hams marked 87¢ per pound. Merle Ellis. I bought two ten-pound hams. It should be said here that my husband was not quite as thrilled initially with my purchase until he realized he’d been buying sliced ham at the deli for $4 or $5 per pound. He then admitted that it was a pretty good deal. Dorothy Parker said eternity is two people and a ham, but here the ham seems to be disappearing at a shockingly rapid pace. I cut one ham in two more-or-less equal-sized pieces & put half in the freezer; we are eating from & cooking from the other half. The second ham is still in its original wrapper and will keep in the refrigerator at least until February, or whenever we decide to cook or freeze it (ham keeps wonderfully well.) We seldom have it the rest of the year, so it’s a treat in very late fall and winter (traditional hog-slaughtering time). We’ve been making it into scrambles and ham sandwiches and just big ol’ chunks of ham eaten as is, but I made a couple of dishes that we really liked. The first is a sauce that I used on Brussels sprouts, but I think it would also be good on shredded sauteed kale, cabbage, beet greens, green beans, broccoli, and whatever else might come to mind (warm spinach salad?). At this time of year the intense deep flavors of winter vegetables sometimes needs a little perking up, and this was really, really good as well as insanely easy. Put the cut-up ham into a dry frying pan over medium-high heat and fry, rendering the fat, until the bits are browning and crispy. Add the apple juice and continue to cook until reduced by half and the juice is turning syrupy. Stir in the mustard. Toss with hot cooked Brussels sprouts. In lieu of ham, some cooked and mostly-drained bacon or sausage would work very well. The other thing I made is just a fast riff on the Pennsylvania Dutch dish schnitz un knepp, which is pork or ham cooked with dried apples. This isn’t even a recipe. Cut some ham into pieces about 2″ X 1″ (more or less) and put in a dry frying pan to brown a bit. Thinly slice some apples (I used Fuji) into the pan, add some apple juice, and toss and fry until the apples are tender. Serve with French toast or pancakes or crepes. Posted in Christmas, recipe, Thanksgiving and tagged apple juice, apples, brunch, Brussels sprouts, cold weather food, gluten free, greens, ham, sauce, schnitz un knepp, vegetables. Bookmark the permalink. I went to the local farmer’s market the other day and snagged three fat bunches of Swiss Chard for a buck each. EACH! They’d been harvested about an hour before. It doesn’t get much better than that. But what to do with them? Fortunately, I also recently snagged The Art of Real Food by Joanne Neft and Laura Kenny, who also wrote the fabulous Placer County Real Food Cookbook. Both books are beautifully photographed, the recipes are simple (though not always for rank beginners), and the books are arranged chronologically so that you can flip to May and see what is likely to be in the farmer’s market, and find a recipe that will showcase that ingredient. Like Swiss chard. I made this soup last night and it was wonderful. It was unusual in that the recipe did not include onions – odd for a vegetable soup – but when I tasted it, I understood why. Onions would have overwhelmed the other ingredients. I did include more broth than the recipe called for, but that’s a matter of taste. The book also included a recipe to deal with those chard stems – deep fried with blue cheese dip. Next time. 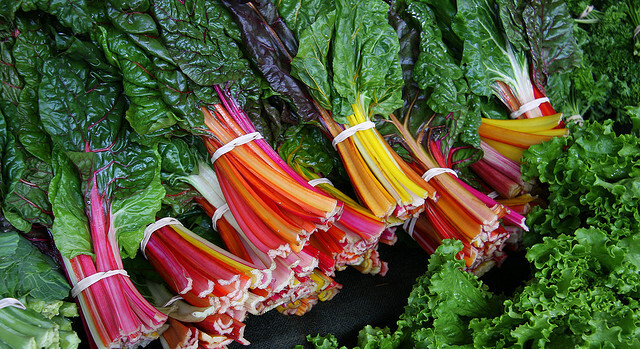 This is a lovely and easy soup for this time of year when chard is springing up in home gardens and farmer’s markets. Heat oil in deep pot. Add garlic, carrots, and celery, and saute over medium heat, stirring often, until the vegetables begin to brown lightly. Add the chard and stir and cook for another 3-4 minutes. Pour in the broth and add the potatoes. Bring to a boil, then lower the heat and add the penne pasta. Cook over medium-low heat until the potatoes and pasta are done. Season with salt and pepper. Serve with grated Parmesan cheese and some crusty bread. 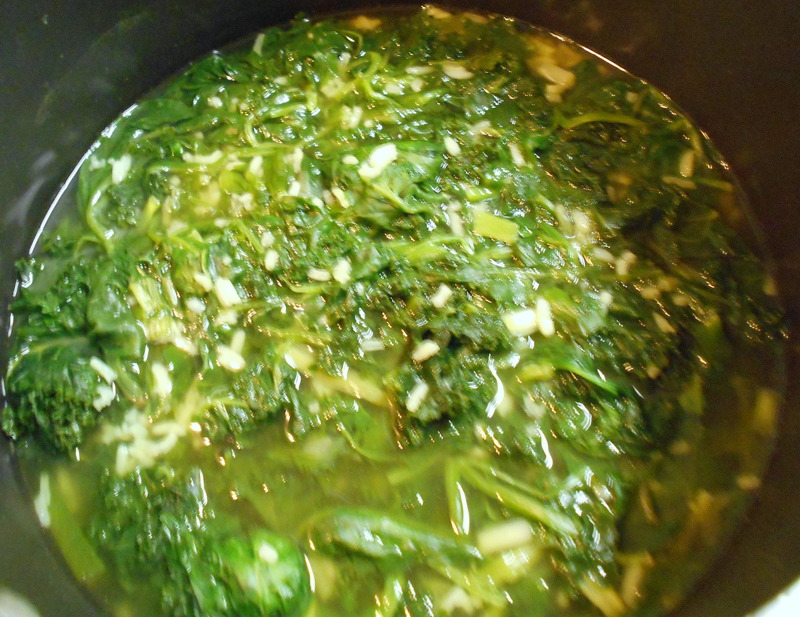 Posted in recipe and tagged gluten free, greens, soup, swiss chard, vegan, vegetable, vegetarian. Bookmark the permalink. When I was a kidlet – that would be back in the early 1960s – the local 4-H club held a Halloween party at the IOOF Hall (that is the International Order of Odd Fellows, and before you start snickering, read about their long history here). After kids got done trick-or-treating (which did not take long in a town with about 15 houses) they gathered at the hall for a costume contest, bobbing for apples (an activity that really isn’t as much fun as nostalgia makes it out to be), a fortune teller, various games, and a Spook House. It was generally accepted that one aspect of the Spook House would be making little kids cry by forcing their hands into cold spaghetti and telling them it was worms. It grieves me in multiple ways that this way of observing Halloween appears to be as dead as the proverbial dodo, for reasons we won’t go into here. But the spirit of serving ghastly-themed foods at this time of year still survives. Melted chocolate chips in cookies drawn out to look like spiders, marzipan green fingers, tombstone cookies. If you’re an adult looking for something weird to serve at a Halloween-themed dinner, this green soup might fit the ticket. I’ll leave it to you to make up a name. This is actually from Love Soup by Anna Thomas, the woman who brought us the best-selling series of Vegetarian Epicure cookbooks. I made a couple of adaptations. Even if it isn’t Halloween, this is a really delicious soup that is extremely nutritious, low-fat, gluten-free, vegan if you so choose, and easy to make. It could be a good way to introduce veggie-phobes to dark leafy greens. Most people buy boxed or canned vegetable broth instead of making it, and that’s fine as long as you read the ingredients and adapt your recipe accordingly. They may contain gluten, sugar in one of its many forms, or assorted preservatives. Almost all of them are salty. They vary wildly in taste, color, and texture. One Thanksgiving I bought three different brands to make vegan gravy/stuffing with. One was very thick and carrotty, one was brown and earthy like mushrooms and potatoes, and one was thin, green and grassy. You might like them all – or none of them, in which case you would do well to pick up a copy of Love Soup and follow one of the recipes for vegetable broth. 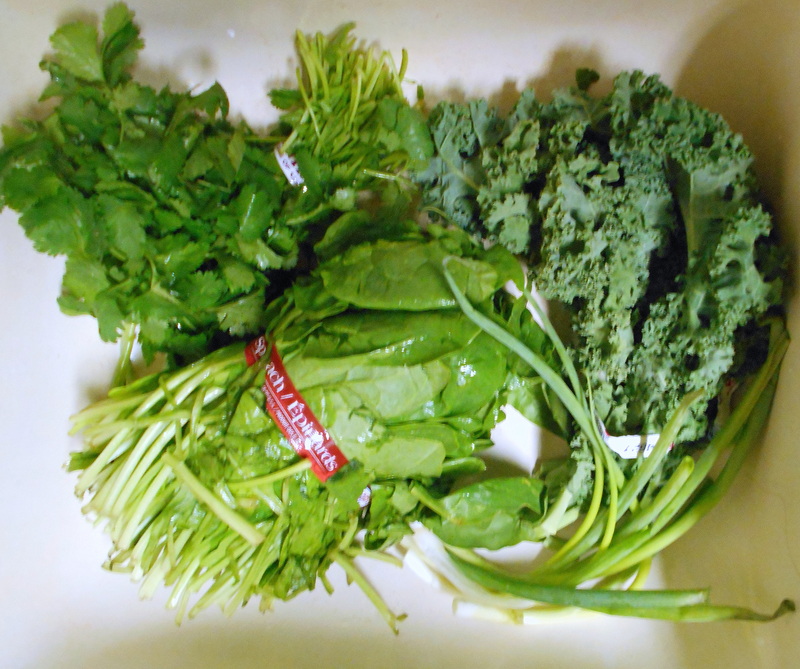 From top left clockwise, cilantro (coriander leaves), curly kale, green onions (scallions), spinach. In a skillet, very slowly saute the chopped onions with a sprinkle of salt in a very small amount of olive oil, stirring often, until the onions turn soft and golden. Do not hurry this – it could take 30-45 minutes. When they are very soft, add the chopped shallot and cook another five minutes, stirring the shallot into the onions now and then. While the onions cook, wash and chop the spinach and kale, discarding the tough stems of the kale. Leave the spinach stems on. (The best way to wash often-sandy spinach is to fill a large bowl or sink with cold water, place the spinach in the water, and plunge it up and down several times. The sand will sink to the bottom. Repeat until no sand appears.) Put the greens along with the rice, the chopped green onions, and chopped cilantro in a large pot with three cups of water and a sprinkle of salt, bring to a boil, then lower the heat and simmer slowly for 30 minutes. You will see that what started as a big pot of greens cooks way down. When both onions and greens are done, scrape the onions into the greens pot and simmer another ten minutes. Add broth as needed so the mixture pours from a ladle. Puree the mixture in a blender in batches until quite smooth. 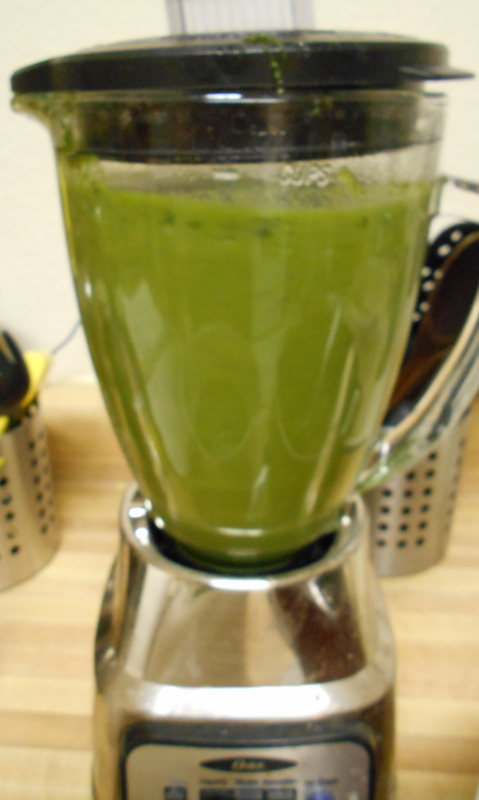 Start on low, then gradually increase the blender speed. (Anna Thomas suggests that you could use a handheld blender. I did this the first time I made this soup. Only do this if you have all day and infinite patience. It takes forever and really doesn’t do a very good job.) Or use a food processor. Return pureed soup to the soup pot. Add freshly ground pepper, the juice of half a lemon, about 1/8 teaspoon cayenne (don’t be afraid of cayenne! ), and let simmer about five minutes, then taste and adjust seasonings as you like. Anna Thomas says she always garnishes this with a drizzle of olive oil, and you could do this if you have really good olive oil on hand. My preference would be some crumbled blue, cotija, or feta cheese, shredded aged Cheddar, Swiss, or Gouda, or some crisp crumbled bacon and chopped seeded tomato, or any sort of freshly made croutons or sauteed bread. A spoonful of plain Greek yogurt or sour cream with chopped green onions would be luscious too. For greens lovers, try a shot of hot pepper vinegar. Use chicken broth, or a combination of vegetable broth and chicken broth. Homemade light stock would be best if you have it. Avoid Campbell’s. It’s nothing but salt. Add milk, half-and-half, or cream. Use olive oil and/or butter. You can use any leafy greens you like: any kind of kale, beet greens, chard, turnip greens, mustard greens, collards, spinach, water spinach, cress, arugula, and so forth. 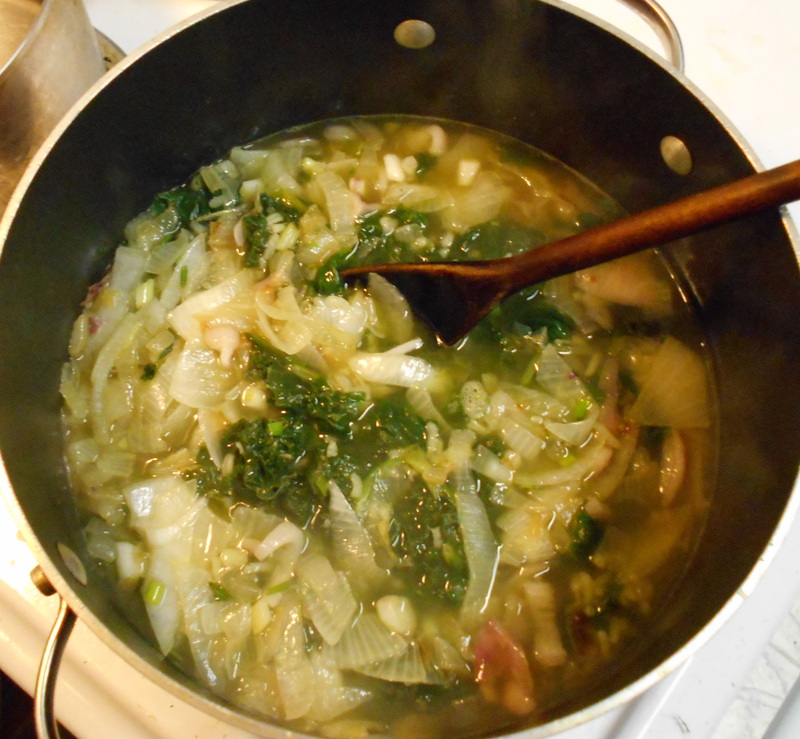 Tougher ones like collards may need longer simmering, and stronger flavored ones will make a more assertively-flavored soup. Substitute freshly chopped garlic for the shallot. 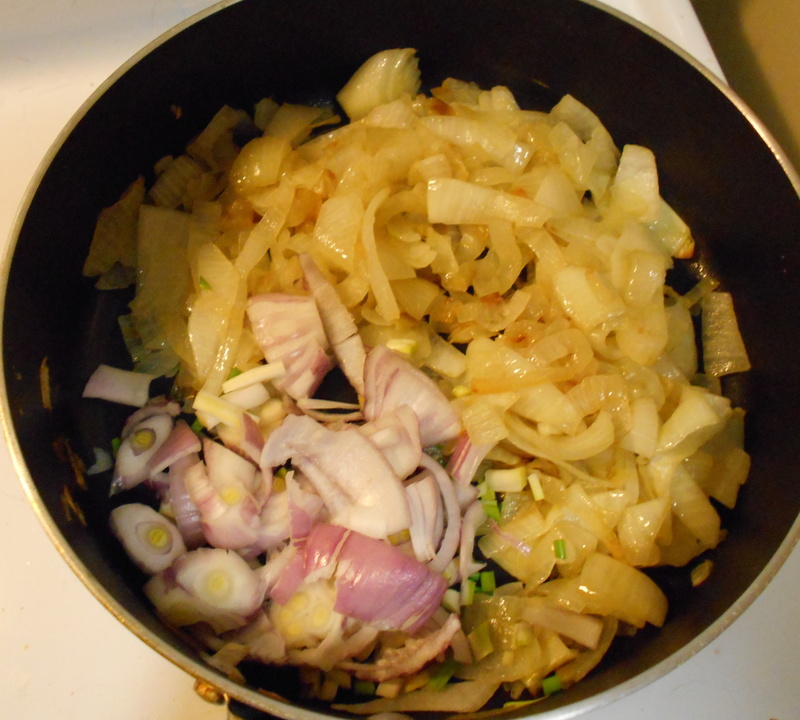 Substitute very well-washed leeks (including the green part ) for all or part of the sauteed onions. Cilantro haters; you cannot taste the cilantro in the finished soup. If you must, you can substitute flat-leaf parsley. 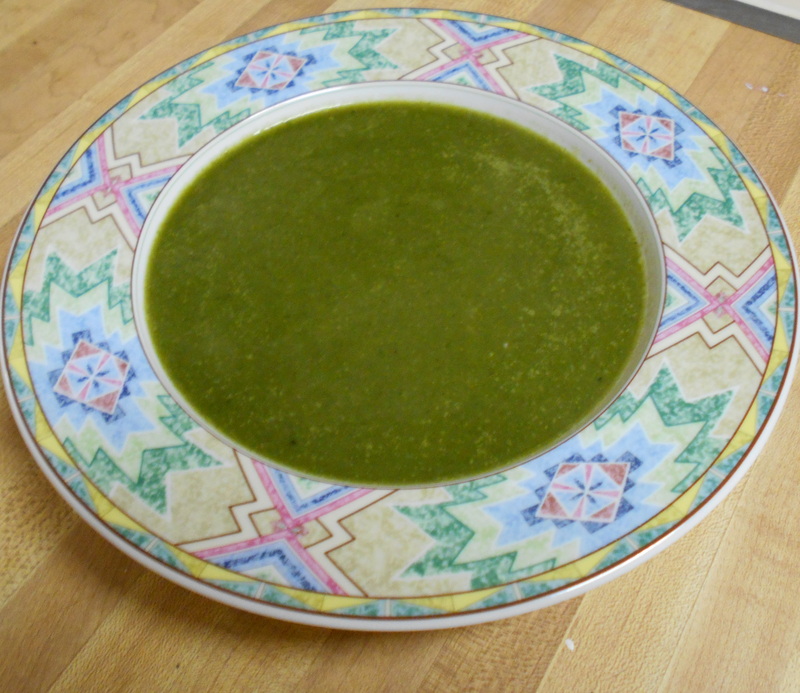 Posted in recipe and tagged gluten free, greens, soup, vegan, vegetable, vegetarian. Bookmark the permalink.